Getting married to your love is a “once in a blue moon” feeling. In the case of Portland newlyweds Christine Zieverink and Adam Higgs it was once in a Blood Moon. Their wedding date, September 27, 2015 promised an extraordinary astronomical event: the combination supermoon (where the Earth is closest to the moon in its orbit) and a total lunar eclipse, also called a Blood Moon because of the way the sun’s rays hit the moon and make it appear red or brown. In ancient times, Blood Moons were linked with fears of the apocalypse. “We thought what better way to go out than with all of our friends!” says Christine dryly of their ceremony at Lake Oswego’s Foundry at Oswego Pointe, which coincided with the apex of the eclipse. Later, guests feasted on an out-of-this-world cake by Portland’s Dream Cakes that featured hand-painted moons in the phases of the eclipse. Each layer was different: coconut cake with passion fruit, banana cake with toffee, and lemon cake with lemon curd. 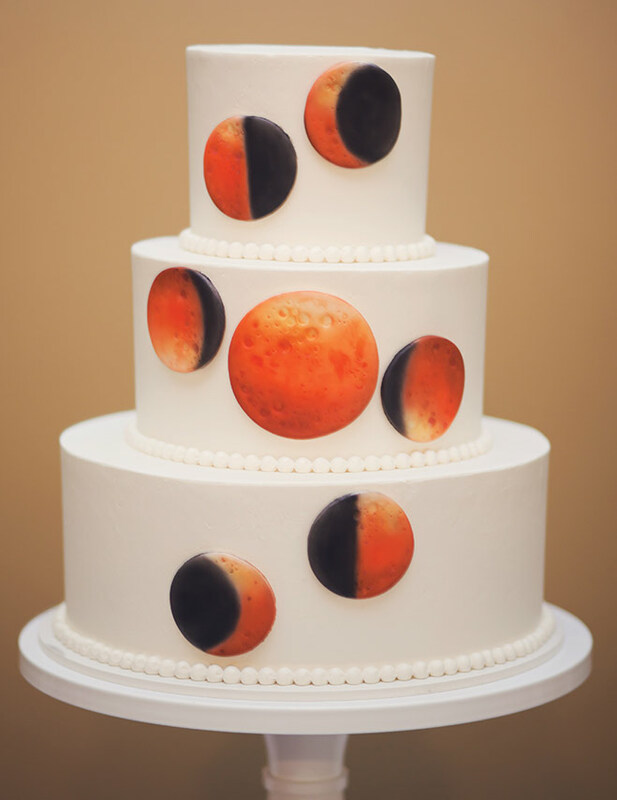 “The cake was stunning and truly captured the beauty of the eclipse,” Christine says. Newlyweds hoping to replicate this celestial timing will have to wait a while. The planets won’t align this way again until 2033.